This uniquely designed residence boasts mutually exclusive spaces for ideal family living. The modernised open plan, with its expansive Lounge & high stud ceiling offers the perception of vast spaces. 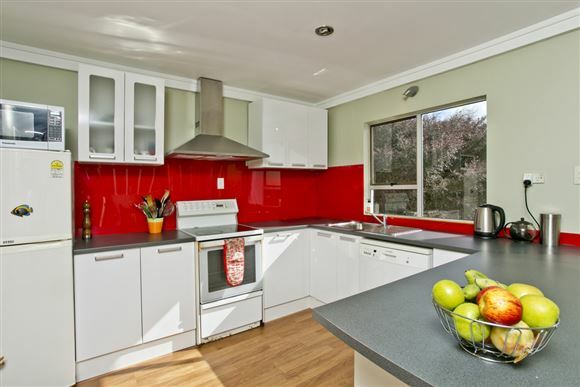 Recently installed flooring, freshly painted walls & a refurbished, modern Kitchen add to the home's contemporary look. The master bedroom with its perched Juliet balcony displays majestic sunsets over the Waitakeres & waters of the Waitemata inlet. Ideal outdoors for entertainment, with terraced decks, lawns & a fully fenced section. Add to that, the excellent neighbourhood school, the parks playgrounds & reserves, and truly motivated owners, and you have the perfect jumpstart into home ownership!